Alright, so, now we get to what actually acted as the opening to the show, and it’s not a bad surrogate for the pilot. It doesn’t fill in all of the questions the audience probably needed answered in order to really start grabbing onto the show, and tries a little hard to give the audience some “cliffsnotes” on the characters, but, it still is a solid episode. I’m not recapping who everyone is, so, here’s a link to the first episode. The episode begins with Mal, Zoe, and Jayne in a bar on “Unification Day,” which is a holiday that celebrates the end of the Unification War. Mal, having fought for the losing side in that war, picks a fight with an Alliance zealot, who wasn’t “burdened with an overabundance of schooling.” In the middle of a bar full of Alliance supporters. So, Mal get thrown through a holographic window, in one of the best shots in the series. Zoe and Jayne help out, but at the end the trio are backed against a cliff by the crowd. Luckily, Wash arrives in the ship in time to save them by threatening to blow a new crater in the moon they’re on (which he couldn’t, since Serenity has no weapons). On board, Zoe comments that Mal has made a tradition out of starting a bar brawl on Unification Day in order to express his anger. Meanwhile, Simon is tending to River, who is still crazy, just so everyone is clear. She is still having traumatic nightmares about her time in the Alliance Academy where they experimented on her, and her emotional responses to questions about it range from hysterics to dispassionate disinterest. She also spontaneously states Serenity’s make, model, and class code, something that Mal comments even he doesn’t usually remember, hinting again at River’s superhuman intelligence. The crew heads to Serenity’s next job, aboard a space station owned by a man named Adelai Niska (Michael Fairman). Niska is simultaneously every Eastern European Mob Boss you’ve ever seen in a film and yet still a fairly unique character. He doesn’t yell. He talks calmly and in a very intelligent and educated manner, and, to him, everything is a business transaction. He gives a short speech about how he knows of Mal by reputation, and Mal knows of him by his own vicious reputation. Then, Niska shows Mal a hanging corpse of the last person who failed him, in order to drive home that his reputation is completely deserved. Despite this, the crew of Serenity take the job to rob a train, but are not told what they’re stealing. In fact, Mal seems to prefer not knowing. The team prepares a plan which involves Mal and Zoe boarding the train and Jayne being lowered into the car where the crates they’re stealing are located, then pulling all three of them into Serenity with the goods. Unfortunately, the plan fails when an Alliance guard stumbles on them, which leaves Mal and Zoe on the train, while Jayne and the goods get back to the ship. Fortunately, the two aren’t seen taking part in the theft. Unfortunately, the sheriff (Gregg Henry) at their destination finds their cover story as a married couple to be suspect, possibly because Zoe cannot pretend to view Mal in that way. While Mal works to charm his way out of trouble, the pair learn that they stole crates of medicine which were supposed to treat a degenerative disease plaguing the planet. We also get a cut to the Alliance authorities, who dismiss investigating the theft or helping the town on the grounds that they’re a poor planet. Just to drive home that the Alliance are basically all dicks, so you never need to feel bad about when they get screwed. Jayne tries to assume command of the ship in Zoe and Mal’s absence, but he is drugged unconscious by Simon. Inara uses her status as a companion to bail out Mal and Zoe, but Mal decides to return the medicine to the townspeople. When they do, the sheriff clearly knows they took it, he decides to overlook the theft out of respect for Mal’s decision to return the goods after hearing about how desperately the town needed it. Naturally, they are aware that this will piss Niska off, and are quickly proven right when Niska’s chief enforcer finds the ship when Serenity misses the rendezvous time due to having to rescue Mal and Zoe. 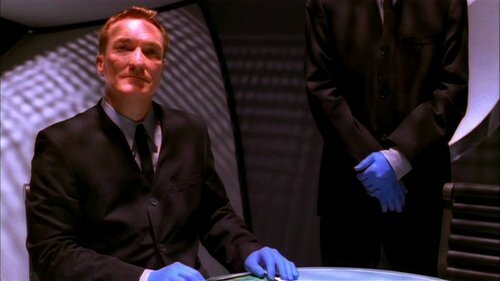 Mal offers to return all of the money paid by Niska to Niska’s hulking enforcer, Crow (Andrew Bryanarski), who politely disagrees with Mal’s argument of “I’ll make it square,” because Mal clearly doesn’t understand the concept of expectation damages in Contract Law. Granted, this contract isn’t enforceable in court, and Mal couldn’t possibly pay Niska the amount that Niska lost due to Mal’s decision, but when you f*ck up on a job for a gangster, you always offer them the amount that they were expecting to make on the deal. They might still kill you, but that at least doesn’t seem like as much disrespect. That’s Thief Subcontracting Rule 1. Crow responds by telling Mal that he may as well keep the money, because Mal is now going to be hunted. He is going to be tailed to the far ends of the universe, and the last thing that Mal will ever see is Crow’s knife taking his life. THEN KICKS CROW INTO SERENITY’S ENGINE, VAPORIZING HIM. I don’t think anything quite expresses exactly how perfect the timing is by Nathan Fillion in this sequence. There’s Mal clearly weighing his options for a split-second, realizing that he doesn’t have any other options, and doing what he has to do. Another henchman is brought in front of Mal, who begins the same speech over again, verbatim, but the henchman interrupts him to tell him he got the speech the first time, and that he’ll tell Niska what Mal said. Back on the Alliance Cruiser from before, two men come in wearing blue-gloves and inquiring about River Tam to the colonel who refused to investigate the theft earlier. River earlier had uttered the phrase “Two by Two; Hands of Blue,” indicating that either she knew about these men previously or that she is sensing them now. This episode has some pretty great moments in it. The opening where Mal is thrown through a holographic window from what appears to be an old-timey saloon is probably the best quick explanation of the nature of this universe. The next shot, featuring multiple moons and what appears to be a Gas Giant behind them, also speaks volumes: They’re on a moon that has been terraformed to sustain Earth life. Wash confirms this a few seconds later when he calls it a moon. This hints to how so many planets can appear in the series without faster-than-lightspeed travel. The entire show is in one solar system, which contains at least one or two large gas planets that have multiple planetoid moons orbiting. They never explain exactly how terraforming solves the heat/gravity problem, but it’s the future, shut up and love it. The scene also drives home one of the aspects of the series that helps motivate and justify Mal’s position: It’s the future, but a lot of people don’t get the benefit of it. Most of the planets on the “outer rim” don’t get futuristic technology or, at least, not much of it. The Alliance, despite governing “the Verse,” doesn’t really build these outer planets up. As Mal says in the first episode: “Once they’re terraformed, they’ll dump settlers on there with nothing but blankets, hatchets, maybe a herd. Some of them make it, some of them….” The placement of this bar is a great indicator of that. Adelai Niska is one of the best characters created for the show, despite his relative lack of screentime and characterization. He’s basically a dark reflection of Mal’s “noble thief” archetype. While Mal is willing to take a job without knowing what he’s doing, once he finds out that he’s killing desperate people, he admits that he doesn’t believe anyone has a choice but to do the right thing. Niska, clearly, thinks otherwise, since he’s fully aware of the condition of the planet. Given that it seems like the medicine is only for the plague that the planet is suffering from, and that the plague is apparently unique to the planet, Niska is likely just stealing it in order to sell it back to the planet at an outrageous price, given the desperation of the citizenry. That’s probably the most despicable thing a person can do, but damned if it isn’t profitable (ask… God, how many companies could be listed here? I mean, it’s literally why we have medical patents (different discussion on this later)). The thing is, Niska also appears to have a code that he obeys. There is nothing to suggest that he would have double-crossed Mal or was underpaying him. He did not lie about what was in the crates, and Mal chose to do the job blind. Niska did not threaten Mal to convince him to take the job, nor did he do anything to sabotage Mal’s efforts, he just made sure that Mal knew that failure would not be tolerated. He is a businessman, it’s just that he does less of the “sue for breach of contract” thing, or the “firing for bad performance” thing, and more the “skin you alive” thing. He is pretty much the lawful evil to Mal’s chaotic good. It really makes their scenes extra intense. Fortunately, Simon keeps the issue from coming to a head, but it still shows the odd version of loyalty Jayne owes to Mal. Ultimately, this is a pretty good re-do for the pilot episode. It conveys a lot of information without too much exposition, and has a lot of elements that really represent some of the best parts of the show. 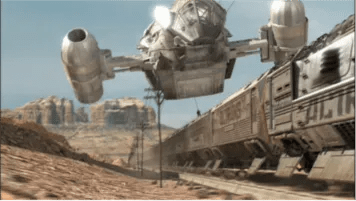 Plus, it’s a train robbery with a spaceship. That’s just a great premise on its face. Unfortunately, it also has a lot of lines that were clearly filmed to introduce things to the audience that they would have known if they had watched the last episode. Most of the character relationships are either shoehorned into clunky dialogue or skipped entirely. In a show with such a diverse cast and a lot of character development over the series and the movie, that’s not great. Even the line by the sheriff about how Mal had a choice probably could just have been conveyed with him seeing Mal return the crates and not arresting him. If Fox hadn’t interfered, this problem probably wouldn’t have existed, but, since I don’t have the ability to view parallel worlds at the moment, I can only judge this by what I have seen.